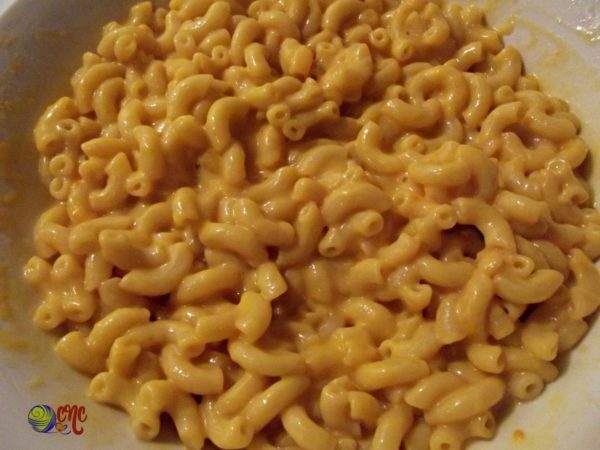 Here is a variation of your regular macaroni and cheese dinner. 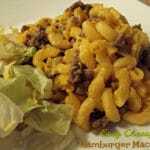 And the best part is that even though you’re in a hurry to put dinner on the table, this hamburger macaroni doesn’t have to take much longer to prepare. While the pasta is cooking you have time to make the hamburger. And while the hamburger is simmering, you have time to put the finishing touch on the pasta. To be honest, I really don’t care for boxed stuff because of all the funny ingredients listed; but sometimes you just want something quick and easy. And with the ground beef it’s really not so bad, it actually tastes pretty good. Plus, it goes really good with a salad, so you still have a good healthy meal. Another bonus, with the ground beef, you eat less of the pasta. And it cooks up in about 20 minutes and cleanup is quick and easy as well. So basically you follow instructions on the macaroni and cheese box to cook that up. Try to avoid the microwave, which can alter the food somehow. And also, be sure to use real butter instead of margarine. Trust me, the taste of real butter is soooo much better, and healthier too! 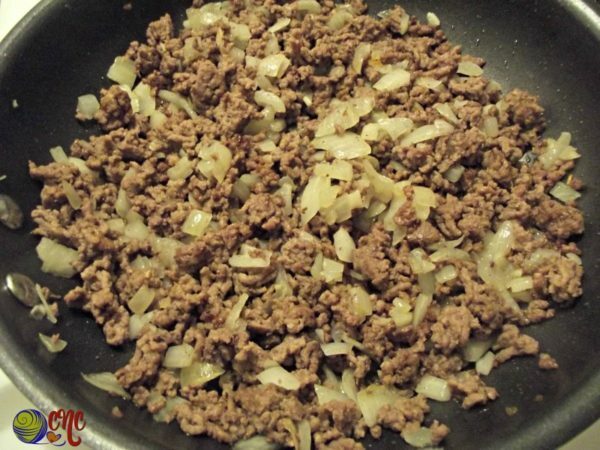 Then, as already mentioned, while the pasta is cooking, you brown the ground beef. Then add the garlic and onion. When all is said and done, transfer both into a medium to large size bowl and mix together. Ta-Da! Dinner is ready! You can serve this along side your favorite salad. 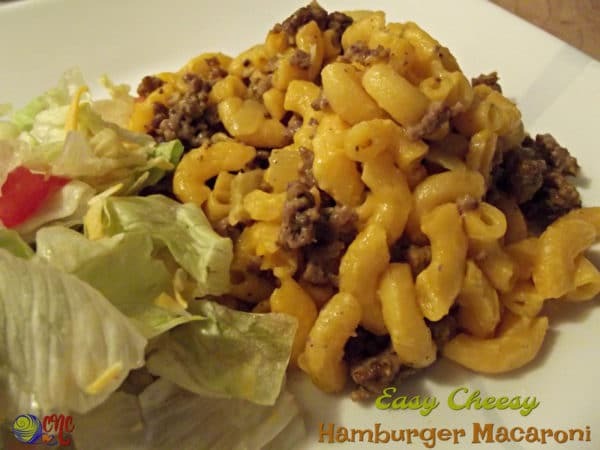 Another option is to make a bed on your plate with the salad and then spoon on the hamburger macaroni. For the salad, I like mine with iceberg lettuce, tomatoes, cucumbers and some olives. So even though you’re eating out of a box, you can still turn this into a somewhat healthy meal if you want. In a medium size pot, bring about 6 cups of water to a boil. Add pasta and cook until tender, stirring occasionally. Drain. Add butter, milk and cheese sauce and mix thoroughly. Brown ground beef on medium-high heat. Add in the onion and garlic and cook until onions are transparent. Transfer everything to a medium-large bowl and mix together. 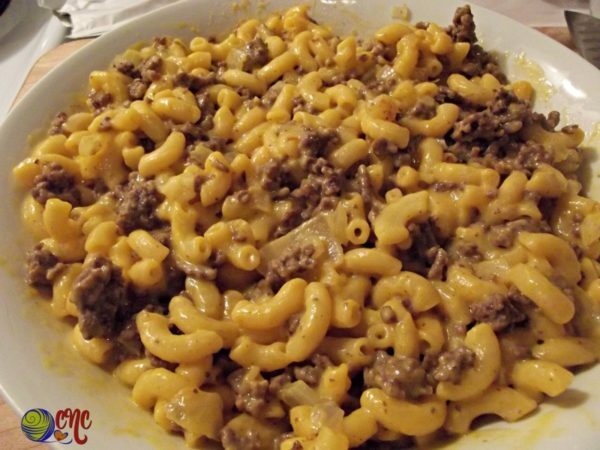 I have a favourite mac ‘n’ cheese recipe for my slow cooker, but I decided to use your beef-garlic-onion mix to add to it. 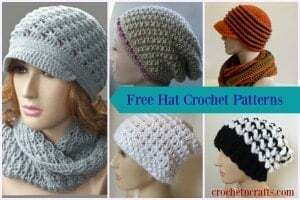 It worked out beautifully, everyone loved it – a winner!